Geared up and ready. Leaving Friday morning for a 1000 km snowmobile trip around Algonquin park on the OFSC trails. Should be a good trip. I was going to go last weekend, but the trails ended up being terrible thanks to a Wed/Thursday downpour last week. Glad I waited with all this fresh snow. The trip should be four days and 3 nights in the tent. Never done a multi day trip on the sled before. We will see how it goes. Family day weekend so trails might be busy, but I guarantee I will have the nights to myself haha. Looking forward to a great trip report when you get back. Left Pointe au Baril first thing friday morning. Rode through Ardbeg, Dunchurch, Sundridge, and past Powassan and camped at Killrush lake. Slush was thick on the lake, and the powder was past my waist on 36" snowshoes. Had a good night, and because the temps were warm, I let the stove go out. Back on the trail at 7am, and rode into Mattawa for fuel. Saw several moose on this stretch of trail. Went through Petawawa, on to Pembroke where the trail turns toward a southwestern direction. Into Round lake for fuel, and it was time to look for a camp site. Met a couple of guys on the trail and ended up finding a good spot on Jenkins lake, west of round lake. -20 that night, so cut up firewood for the pending night. I wanted to figure out how long between burns the stove would go on dry spruce. My bag is a -18 down bag, so burning all night is standard for me. I figured out by setting my alarms that my fourdog ul2 will go 2 1/2 hours between fills of split softwood. 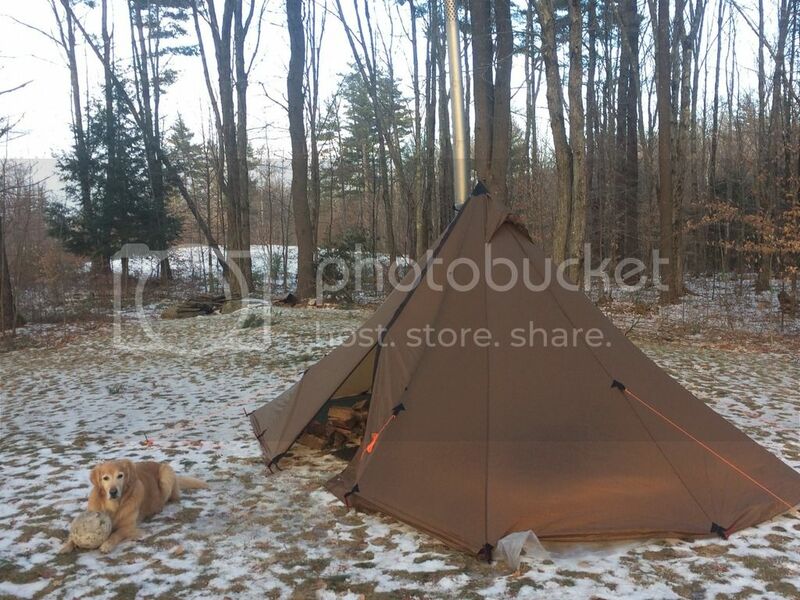 That worked pretty well and kept the tent hovering around the freezing mark. First night with no stove there was frost on the outside of the bag. With the stove on, despite being around freezing, the bag was bone dry in the AM. I am happy with a 2.5 hour burn. I usually use hardwood, and that gets around 4 hours. Up in the morning for bacon and eggs, and hit the trail again. The trails till this point had been perfect. No bumps, and wide and fast. First stop for gas was Whitney. Then into the algonquin park crossing. The park and the following Haliburton highlands were the most scenic trails I have ever been on. Long, winding hydro lines and huge hills, yet still able to travel 40-50 mph. Because of the family day weekend, once I hit the muskokas, things got a bit more rough. Went over kinesis lake, lake of bays, and through huntsville eventually to the seguin trail and home to pointe au baril. the trip was supposed to be four days, but I was there to ride the trails, and ended up doing 1200km in three days. The gear rode on my Polaris 550 voyageur perfectly,and I got quite a few looks, as adventure touring by snowmobile while camping isnt exactly a widespread thing! Ton of fun. Cant wait to plan the next trip! I'm curious what if anything you'd change for your next trip. Also, do you think you'd ever need to tow a sled, or were you happy with how everything fit on your snow machine? I've never done any real touring or overnights on snow machines, so my ears perked up when I saw your post. It's really something I'd like to get into next winter. any chance you would put a few on here for me if you pmed me a cell number or an email address?